Your banner is your online storefront. It gives your Reverb shop character and personality. It also gives buyers the perception that if you took the time to make your shop look professional, you will take the time to provide a great experience. You can upload your shop banner via the Shop Profile page. Make sure that your shop banner is sized correctly. Banner specifications are 960px wide x 160x high and at least 72dpi. Include your shop name on your banner. It's basically your storefront sign, so add a tagline or product summary as well. Stand out by choosing a beautiful photo or a well-designed image to represent your Reverb shop. Add your logo if you have one. Share a little information about your shop. This can also be edited via the Shop Profile page. Your description can include your gear interests, if buying/selling gear is your profession or hobby, and anything else you think buyers might find interesting. Telling your story in your description helps to gain the trust of potential buyers. Let the Reverb community know who you are! Do you have a video of your gear collection or your store. Add it to your shop profile to let customers get to know you even better. Let people connect to you beyond your Reverb shop with a link to your website. This will help set you apart. 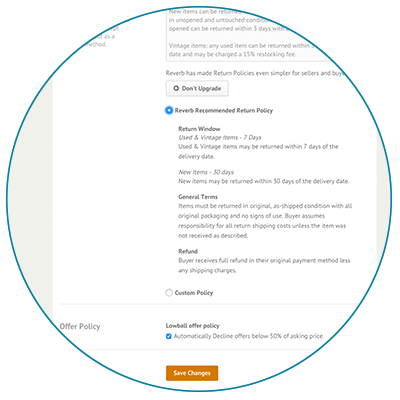 Set your shop policies before you start selling. If your intentions are clear from the start about what will (and will not) be provided, buyer expectations can be managed so that everyone has a great experience. 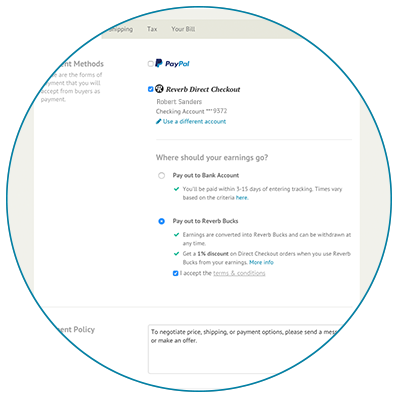 Reverb Payments and PayPal are the available payment methods. Accept both to reach more buyers. 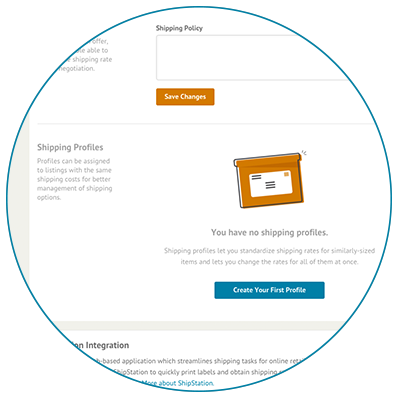 Shipping Profiles let you standardize shipping rates for similar items to save time on future listings. A clear Return Policy is essential. Choose between the Reverb Recommended Return Policy or customize your own. There are a few hints to get your store in our Top Shops section. Once there you will be on the front lines to our hundreds of thousands of customers. Make sure to look at our Listing Standards to understand the do's and do not's of listing on Reverb. Once you have your first sale it will be much easier to establish yourself as a trustworthy seller. Try selling something small to get started. To be on our Top Shops list you must have at least 20 listings. Don't forget, one of the best ways to sell on Reverb is to find great deals on Reverb. Our Top Shops page is sorted by who has the most recent sales. The more you sell in a short amount of time the higher on the list you'll be. There are a few ways to give your listing an extra boost. Share your listings through social media and tag reverbdotcom. We love retweeting and reposting great listings, exceptional deals, and interesting gear.